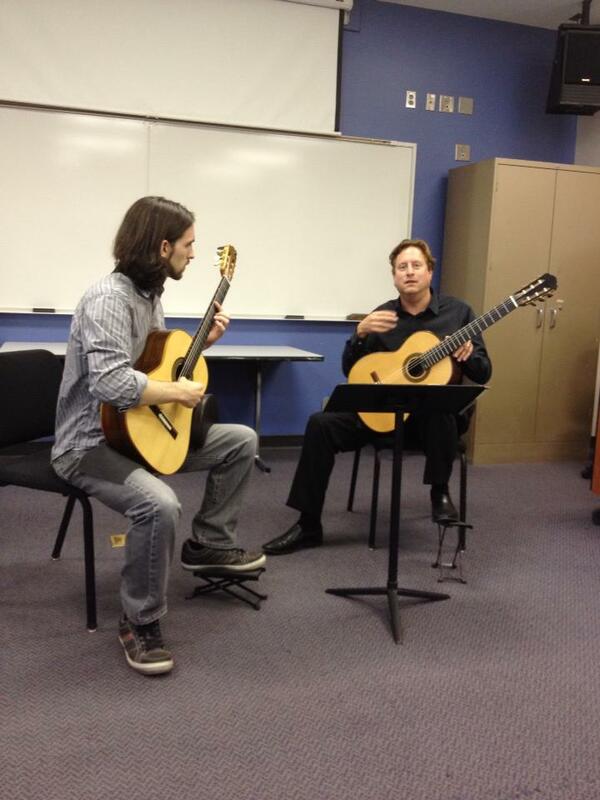 Congratulations to guitarist, Jason Vieaux, for his Grammy win this evening. He takes the award home for Best Solo Instrumental Classical for his new album, “Play”. If you are unfamiliar with his work, he has been a prominent figure in the world of classical guitar since he became the youngest person to ever win the GFA (Guitar Foundation of America) competition at age 18. He is on staff at the Cleveland Institute of music, has an active recording and performing career with an astonishing arsenal of solo and chamber repertoire, and teaches online through Artist Works. He is also a notorious vowel hoarder; “o” was the only vowel to escape his last name. I’ll use this moment to brag about my experience meeting Vieaux. It was a little over a year ago now that I played for him in a masterclass, and it was one of the most interesting classes I had ever been involved with. Teaching seems to come easily to him, being very knowledgeable, articulate, and personable. 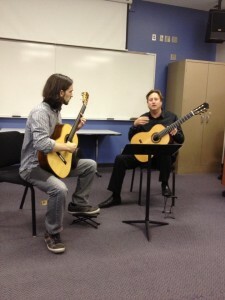 Below is a picture of me with Vieaux during the masterclass. I should mention, I normally am well dressed for such occasions, and regret my attire for that day. Like any proper music student, I had my excuses for the clothes (and for the only 2 hours of sleep the night before), but I will not list them here. Needless to say, it was not my best performance, but I walked away a better musician. As with anything – there are good days, and there are bad days, but you can build on either. Perhaps even the bad days yield more personal growth. Enough with my scattered philosophy and here’s to Jason Vieaux for another outstanding accomplishment!